It has been a while since I’ve communicated with you. Coming off of 2017, I had so many projects lined up that they got bottle-necked, traffic jammed and then they had a major accident. LOL!! I’m sure many of you have been there before. I usually work super fast and get a lot of stuff done but every once in a while things don’t work out the way I plan them and that’s a good thing. I was making my plans and things starting going awry. This was a huge development for me as I have gotten too comfortable with “making plans” instead of simply “planning how to get THE WORK done.” This shift was a personal one but it more of spiritual one. I’ve been moving and operating fast but at times, too fast. And although I understand that “money is attracted to speed” I also know that “God’s will is attracted to Your purpose.” So I’ve had to slow things down a bit and get back in line with the purpose of and for my life. And also realize and practice what I tell my students and that is….. “Slow practice will get you there faster.” And that doesn’t mean that you move slow, it just means that you aren’t so fast to move that you do so without moving purposefully. With that being said, I have a lot more seminar dates this year than I had last year. And I’ve already been to Charleston, South Carolina last weekend (grip fighting seminar) and in the following week I will be on the West Coast (private academy Judo seminar). Then at the end of April in Tampa, Florida I have an Armbar Deliberate Practice Seminar. And then in May I have a seminar on the Clock Choke. And since the seminar on the West Coast is a private closed-door seminar for only the members of a certain academy, the next open seminar that I am having is on the 29th of April in Tampa, Florida. It’s a deliberate practice seminar on the technique, Juji Gatame. Also known in the BJJ and grappling circles circles as the armlock or the armbar. I really had a wonderful time in Charleston, South Carolina this past weekend. It was refreshing to be on the mat with people who just loved doing the sport and art of judo and were not pushing to make the next team, to win the next tournament or looking be the number one player in the world. Don’t get me wrong, I love coaching those individuals too but we all came from grassroots programs and the grassroots programs produce the Olympians, the referees, the table workers, the world champions, the coaches, the national champions and the practice players. The grassroots programs really RUN judo, not the International Judo Federation. . The IJF exists because of the tiny clubs around the world that do what Elijah Fletcher does at his school in South Carolina. And that is, create a safe space for students to train and learn judo. Let me be honest with you. I was not good at this move when I was competing. I reallly didn’t learn this move well until I retired. I didn’t understand how in the world it would work on a grown man who was 220lbs (100 kg). But I understand now. When I started my career as a judo coach, I was a great polisher. This is not at all abnormal for a world class athlete with good communication skills and the desire to coach. It’s usual for them to be thrown into the top end of the developmental cycle to coach and not into the grassroots coaching realm. I was no different. I could take somebody who already had the raw materials in place, who already had some sort of development, and shine them up and polish them; help them become a champion, help them become an Olympian, help them win worlds, help them win national championships, and I was able to do this because I was a great polisher. But, when I became a grassroots level coach and started coaching with the Bahamas Judo Federation in 2009, coaching inside schools, putting together school programs, putting together dojo programs around the country, and doing the same thing for myself in Tampa, I had to learn how to become a manufacturer – and more so when I had my son and my daughter. I had to learn about total athletic development with respect to human development and early childhood education. I had to learn how to develop someone from the initial stages of nothingness and help them become something. Now, granted, these are all things I knew in theory. The hard part about the grassroots coaching process is that while we are so focused on the students we still need someone to focus on us, and that’s my reason for producing this book. I know that as you continue to pour out into your students every day, you still need someone to pour into you, someone to encourage you, someone to help you grow, and someone to push you forward to higher levels of excellence. I hope you will allow me to pour into you and to continue to share with you. 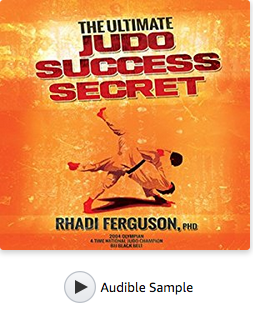 If you are looking to grow and to know more, be more and do more but understand that you just need a good push, the right words at the right time, or a small piece of knowledge that you may be missing, then do yourself a favor and get your hands on my book The Ultimate Judo Success Secret today. Thank you so much for reading and following. I hope that you got a lot from today’s issuance.